A man has been charged after leaving cows for dead through under-nutrition and unsuitable environments. 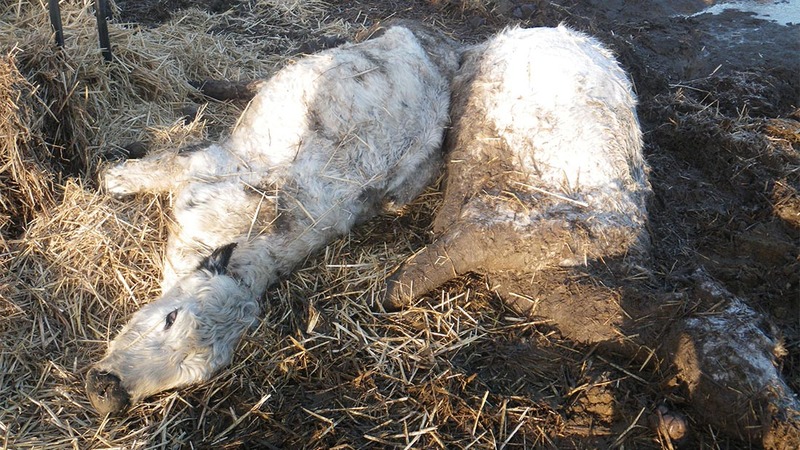 Five of the British White cows were dead and another nine had to be put down. A Bedfordshire man has been banned from keeping all farm animals for life. More than 100 cows were found on his farmland – many of them very underweight, dying or dead. 70-year-old Andrew Peter Leishman admitted to causing unnecessary suffering and failure to provide a suitable environment at Luton Magistrates Court on Monday (November 7). The RSPCA had concerns about the British White cows in January after they were called to find five cows dead, and another nine in ‘such a bad state’ the vet called for them to be put down to prevent further suffering. Another 85 cows were taken into RSPCA care. RSPCA Chief Inspector Mark Thompson said: “I will never forget the sight of so many cows lying there dead, or dying, or so ill that they would have gone that way had we not been called to the rescue when we were. It was truly shocking. “There were many animals lying there so still I thought that I thought they were dead at first. These were effectively starved to death. They just had not been given the food they needed to be healthy and survive. “They had also been kept in filthy, completely unsuitable conditions - with deep litter all around them and in some cases up to their bellies. One poor bull in particular was surrounded by so much filth he couldn’t move. Only 66 of the cows taken into RSPCA care survived and will soon be rehomed. Mr Leishman was given a life disqualification on keeping all farm animals, including equines. He was fined £94,375 in costs to the RSPCA and ordered to carry out 240 hours of community service.